We were fortunate to find this amazingly beautiful and tidy RV resort in the heart of Idaho's vacation village on the Payette Lake. The original owner developed this property and spared no expense in amenities. It was once part of the KOA network. Unfortunately, the owner went into foreclosure and the investors/lenders took it over. We were here in late June and the resort had only a few guests. We were able to obtain a "pull in" site right on the Payette River. The resort is under new management and renamed to Payette River RV Park. Highly recommended!! 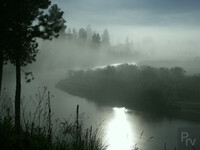 The photos were taken from our site overlooking the river. The foggy scene was taken at 3:00 AM in the morning (don't ask) with my Konika/Minolta Dimage A2 on a tripod in auto exposure mode. It took nearly a 30 second exposure to capture the scene.